When the Original Edition premium reprint was first announced I was quite excited. Then I'd literally forgotten about it until wandering through my local game store and seeing it sitting on the shelf, one lonely copy left. The game store owner told me they'd only received 3 copies and that was all they could get. I'm glad that Wizards chose to make this available in game stores first before releasing it to larger chains and Amazon. 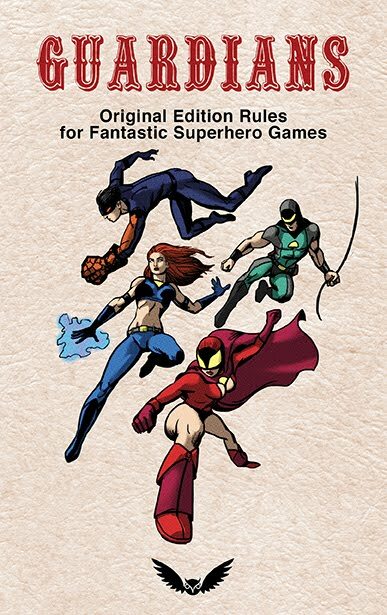 This shows some commitment to the local communities that keep tabletop games alive. Albeit on life support. There are some very interesting and surprising qualities to this reprint. It is really more than a reprint, remastered might be a better term as we'll see. 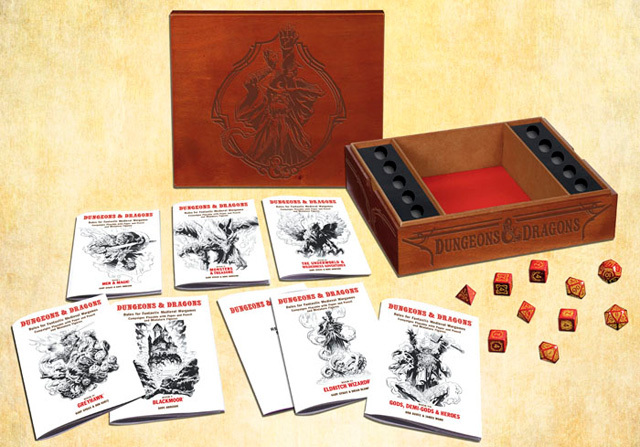 The box is composed of high quality lacquered wood, inside are a full set of dice, the original 3 booklets, all 4 expansions, summary sheets, and some nice art prints. 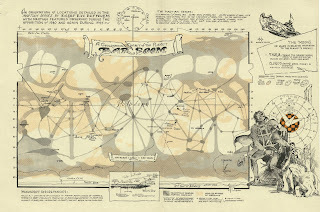 It is a nearly complete facsimile of original edition. All fairly densely packed with only a little air space. It comes across as a nice high quality collector's edition. First thing I noticed when opening the box is how crisp the printing is. I got out my old original edition set for side by side comparison. Not only is the printing sharper, but the books are about a half inch wider and the same height. You can see on the cover headers that Wizards used the exact same fonts, next to the original they make the old ones look blurry. I have copies of that font it is called Quentin Caps, and no available version of that font is that sharp, which means they digitally refined it. There are also some minor format changes like emphasis on Rules for Fantastic Medieval Wargames, and then the rest in a smaller font below. The insides have even more delightful subtle improvements. You can tell they have retyped all the text and layed them out using modern technology for a crystal clear reproduction. Even the art looks cleaner. This is appearing to be a real labor of love beyond what has been done with the previous 1st and 2nd edition reprints. Looking more carefully you can see the line breaks are a little different, and also some word changes. 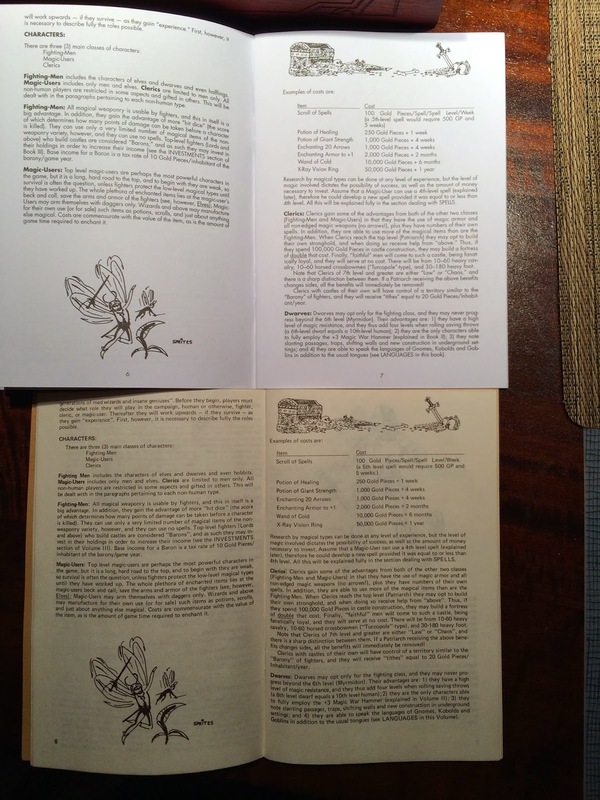 For example referring to these booklets as "books" instead of "volumes". So they did more than just copy the text, some editing has been done. I haven't thoroughly read through them and compared yet, but if my initial cursory inspection revealed changes I suspect there will be more. The paper is thicker so you cannot see through the printing on the reverse side. With the pages being a little wider the document has a bit more room to breathe, so it feels more comfortable. Any criticisms I have are minor, and really more of a personal thing. For example it seems strange not to include Chainmail. I can see why Swords & Spells wasn't included, but that really was the mass combat system for the original edition so having it would have made the set more complete. The covers are a brilliant white, too contrasty to me. I'd like to have seen the covers be on off-white or cream paper. This also made me long for Wizards to go a step further and produce a hard bound single-volume, edited, version with redundancies removed, and making it complete by including all the official material from Strategic Review. So what other piece of nostalgia can Wizards dredge up for us? I think the obvious answer is the D&D Rules Cyclopedia. 1: the gods sang a song, and the lyrics created Warlor. One sour note created evil. 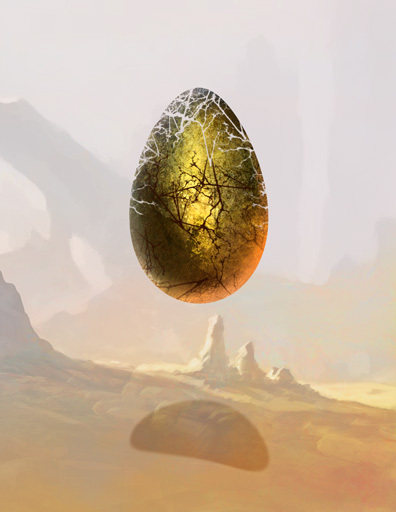 2: a shard of heaven fell and the crash created Warlor. One piece scarred the face of Hatok the most beautiful god, who was so incensed his anger created evil. 3: the lords of creation came together and palavered to create Warlor where they could test their faithful, one lord turned against the others and introduced darkness and deception to the world. 4. a rift was torn in the fabric of the multiverse and a god fell through, the shockwave where she fell created Warlor. 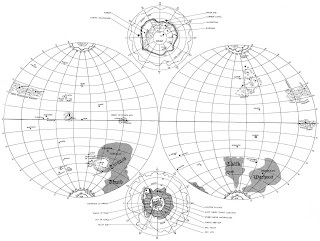 5. ancient aliens, seeking refuge from an enslaved homeworld, terraformed a rocky world and called it Warlor. 6. A god and a demon had an argument, they created Warlor to settle the issue. 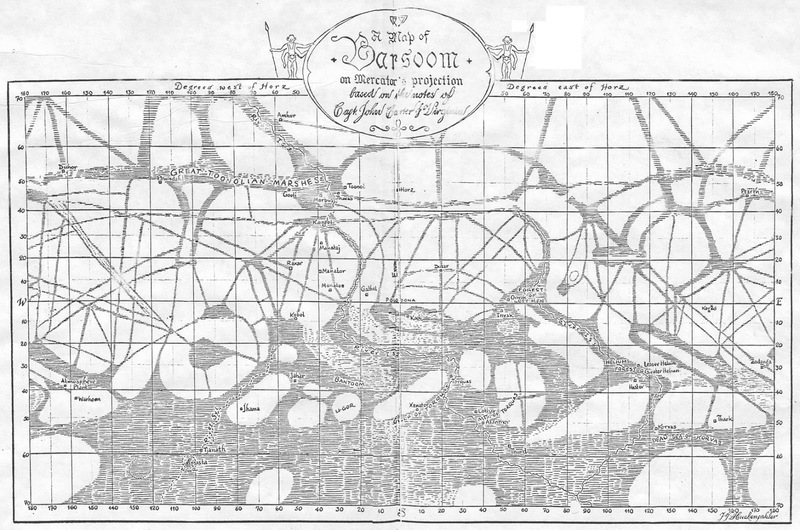 How the Warlor map was created. In Photoshop a blank file was created and the Clouds filter was used on a blank layer. 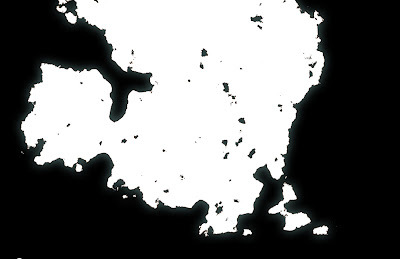 Levels were used to reduce the image to black and white, adjusting slightly between how much black or white in order to create an interesting silhouette. I found some interesting terrain textures by searching for satellite images. Then hand edited them to fit the contours of the map. 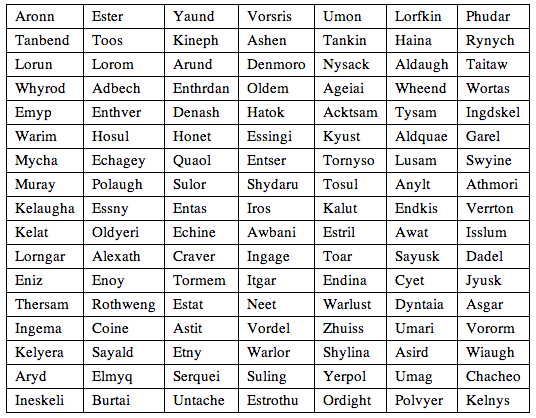 Generated some interesting fantasy names by finding a fantasy name generator (there are dozens out there, in this case I used http://rinkworks.com/namegen/ ). 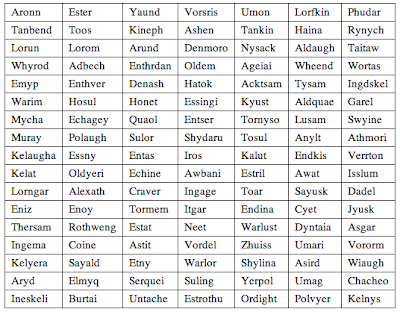 I chose the names I thought sounded cool, slightly modifying some of them. There has been quite a bit of discussion about this font because of the recent Yahoo logo remake. So I decided to use this font. It is a strong stately font, very legible, and projects strength and class. I like its legibility. Warlor! A new fantasy world is born. 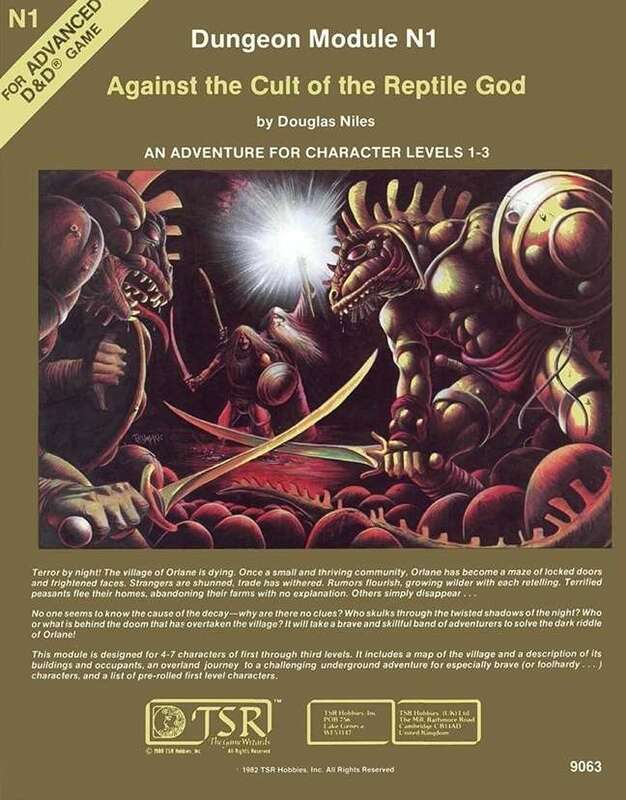 Wizards just made N1 Against the Cult of the Reptile God available in PDF. I have fond memories of running this game back when it first came out. On the surface it follows a familiar formula: quaint village, nefarious goings on, and nearby adventure locals. The added twist is that there is enough going on in the village itself that several adventure sessions and deadly encounters can happen right in the character's home base. Also I really like troglodytes and nagas, they just seem really sinister and nasty making for great villains. And I also admire Timothy Trumans evocative, dark art work that set the tone for this challenging novice adventure. 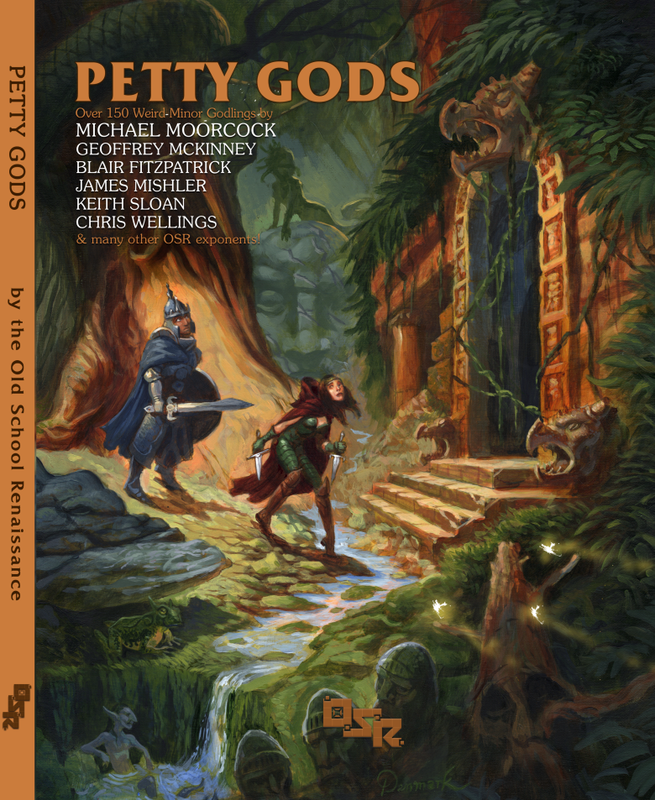 I'm really glad to hear that Gorgonmilk took up the responsibility of getting Petty Gods completed. I thought it was a great idea when I first heard about it, and I donated some art for the interior and the cover. 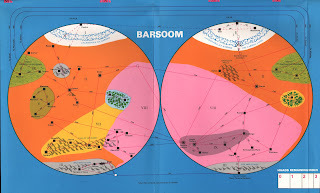 Looking at the direction it is taking I'm thinking it is a good thing that Gorgonmilk is taking on the job, because it sounds much more compelling as a resource book now! Wizards of the Coast is putting together a gorgeous reprint of the original D&D sets. When I first saw this image I thought it was some fan-made thing and my reaction was what a cool idea! I was pleasantly surprised when I saw it was Wizards that was actually putting this together. Well played Wizards, well played. I'll be at Dundracon if you happen to be in the area and want to go to one of the best game conventions in the San Francisco Bay Area. Always lots of excellent gaming goes on. I will have my recent game Murder of Crows available for sale, as well as old classics like the entire line of Dungeoneer games. I should have some art prints, and if you want some Magic, Game of Thrones, or L5R cards signed that I've illustrated for I'll be happy to. I'm trying to get together some art prints as well. 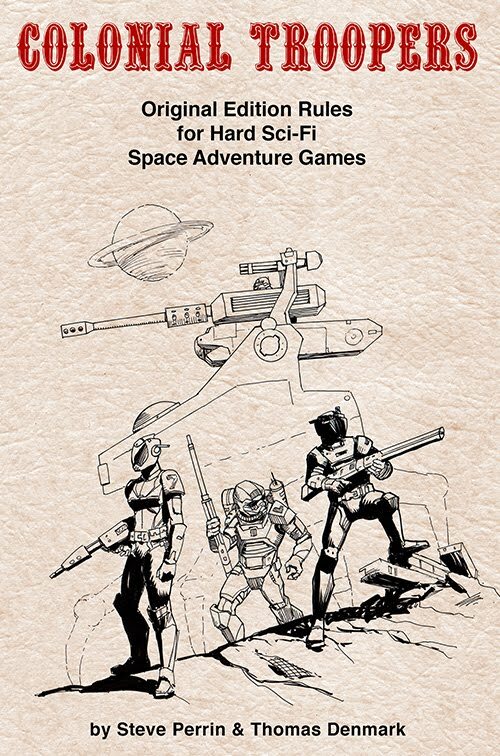 Unfortunately I didn't get Warriors of the Red Planet completed, but I do have the latest version in PDF format on my iPad, and if you buy anything at my booth and ask for a sneak peek of WotRP you can see it and I'll give you a 10% discount. I have been trying for a while now to create a decent map of Barsoom. 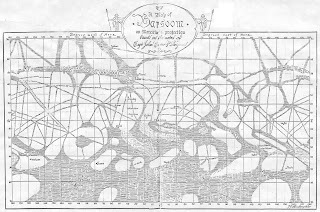 Consulting various sources, taking notes from the books, looking at the many other homemade maps available online. One thing becomes rapidly clear. 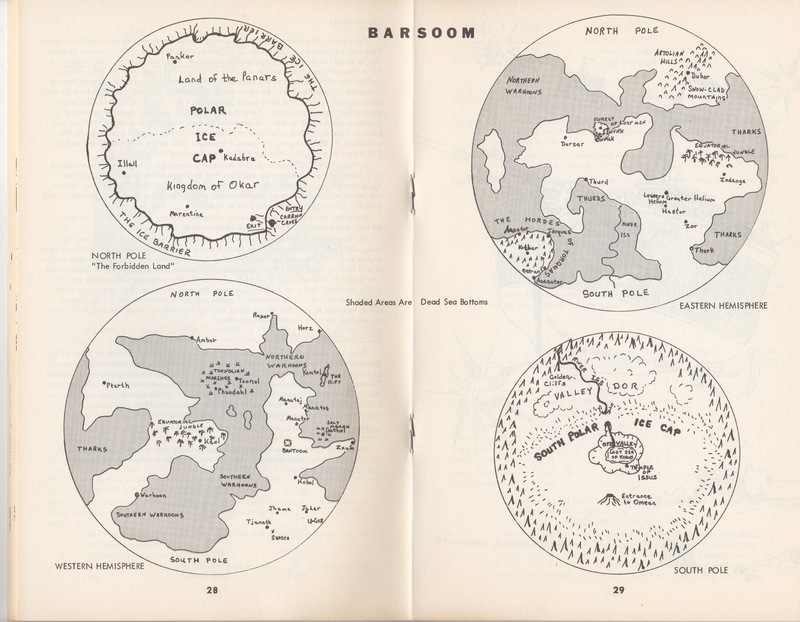 There is no definitive map of Barsoom. Contradiction after contradiction abounds. Even the books seem inconsistant - though it is harder to tell with words compared to actual pictures. 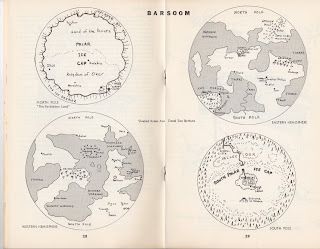 Time is running short and it looks like I'm going to have to just pick what I like best aesthetically and create a map that works best for a semi-sandbox style game to flesh out the Barsoom-inspired Mars campaign section of the book. Here are just a few examples of Mars maps floating about the interwebs. 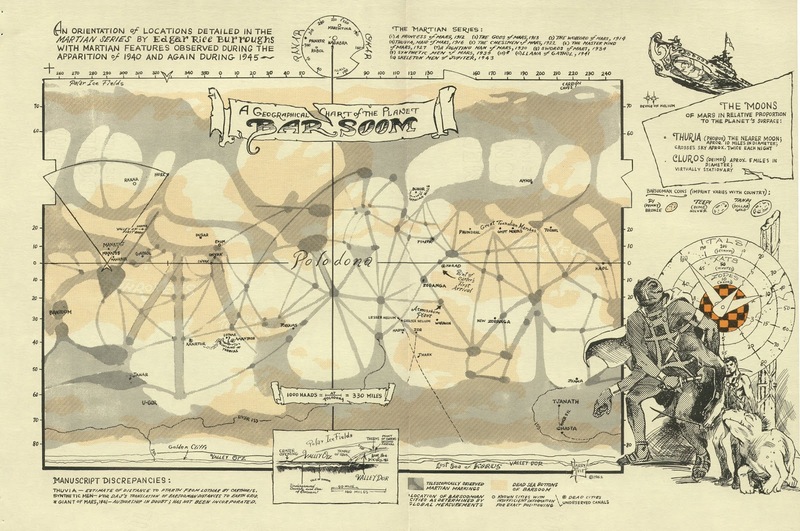 This is a very interesting topic, worthy of several posts, so I'm sure I'll have more to say about it in the coming days as I finish up the version of this map for WotRP. 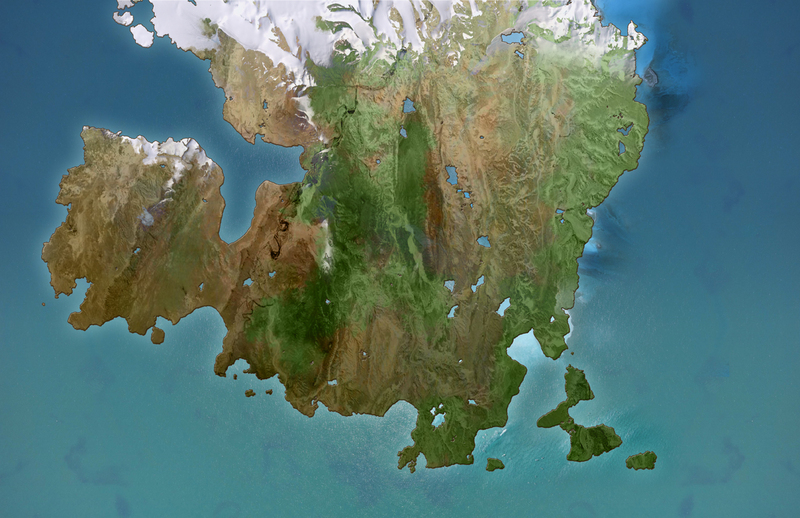 Discuss this on the WotRP forum, where I'll be posting more details and images. 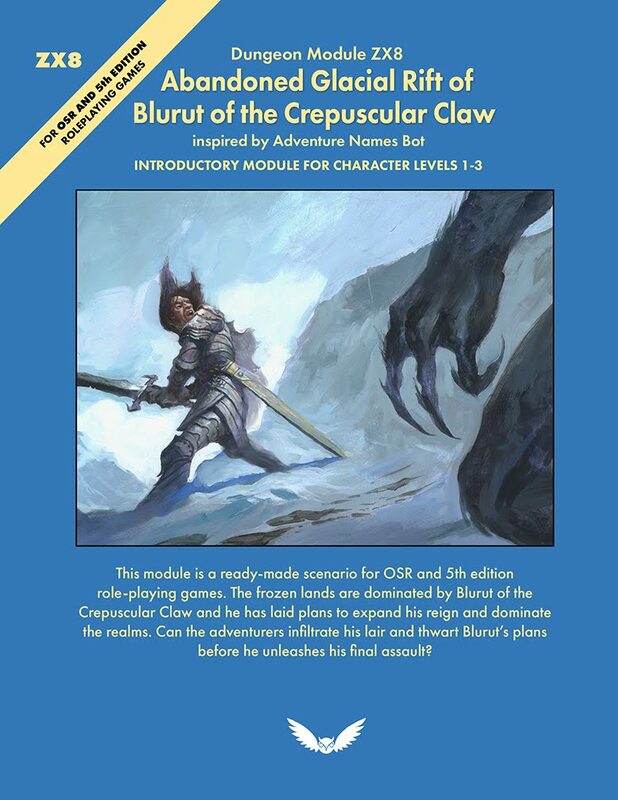 My Friend Ron Edwards has a Kickstarter to fund the next evolution of his great Sorcerer RPG. So far we've mostly previewed characters and creatures and some ships, I wanted to post something really strange. While it is listed in the creatures section of Warriors of the Red Planet, it is really just a great adventure hook. You can view the rest of the description and stats on the Warriors of the Red Planet forum. 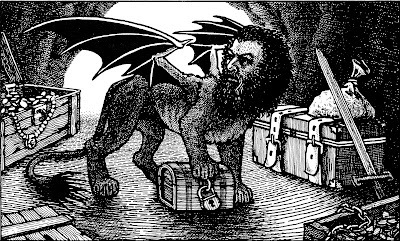 One of the most epic of the old school D&D illustrations. This is the 2012 version! See more recent Jeff Dee art here.